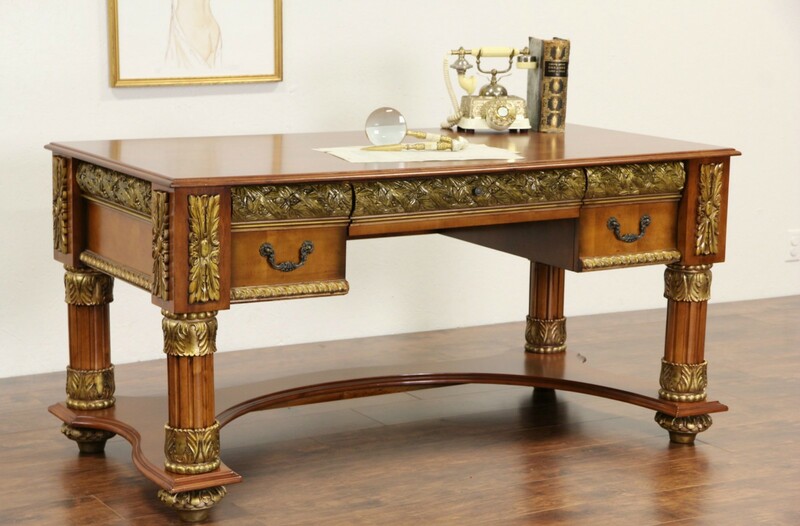 A luxurious library writing desk is about 10 years old, and has opulent dark gold carvings, fluted columns and a trestle base. This unsigned designer furniture was custom made for a home in the fabled Garden District of New Orleans. The excellent satiny finish is on cherry and maple with lavish detailing. Dimensions of this palatial desk are 5' wide, 30" deep, 30" tall and legroom is 24 1/2" underneath. See 27 photos on Harp Gallery website that enlarge to full screen size.